This is the newsletter for the Villages Democratic Club - the largest Democratic Club in all of Florida! The Mueller Report makes my head hurt. I am not reading it, I am listening to people who read documents for a living, and the more I listen the more I confirm every concern I have about Donald Trump. He is the biggest mistake ever made by voters. It seems to me there is more than enough to impeach him, but I don’t think it's wise to start that process. Impeachment winds up in the hands of the Senate, where it would take 67 votes to find the President guilty. (There are 51 Republicans, 47 Democrats and 2 Independents in the Senate). If the Senate did return a finding of guilty and remove him from office, he would be replaced by Mike Pence. If he is found not guilty that will allow him to continue the claim the whole thing was a hoax, there was no collusion, no obstruction and it was several years of “fake news.” More fodder for his base. The people to whom I am listening, much smarter than I am, have clearly outlined a path of deception by Attorney General William Barr. His press conference prior to release of the redacted Mueller report was a blatant attempt to “spin” the understanding of the information. Fortunately no one fell for his machinations, and he has made it obvious he is just another Trump sycophant. The House needs the un-redacted report and must continue to reveal the information it contains. And, we must give some attention to our voting process, which everyone agrees was invaded in some States. Even with that information, nothing has been done to deal with the interference that took place. Florida has a history of razor thin elections. Unfortunately it also has a long history of voter suppression. With more than 8 million votes cast in 2018, only 10,033 votes separated Rick Scott and Bill Nelson in the race for U.S. Senate. In that same election, fewer than 33,000 votes separated Andrew Gillum and Ron DeSantis for governor. Barack Obama won the state by less than 1 percent in 2012, and after almost six million votes were cast in 2000, the final vote difference between Al Gore and George W. Bush was 537 votes. In Florida, when we say every vote counts, we really mean it. Protecting the right to vote and increasing voter participation should have broad bipartisan support. Yet, a divide has emerged in Florida: on one side, Republican politicians are trying to make it harder for Floridians to vote; while Democrats are registering voters and working to protect voting rights. Last November voters from both parties overwhelmingly supported expanding voting rights in Florida by approving Amendment 4, which restored the rights to ex-felons after they completed their sentences. That fact hasn't stopped GOP state Rep. Jamie Grant, who sponsored a bill to redefine the terms of finishing a sentence and legal reentry into society. Rep. Grant's bill would mandate that transportation and medical fees be paid to get back the right to vote. These kinds of fees are not part of the sentence, they are not imposed by a judge and not everyone can afford to pay them immediately upon reentering society. Grant's bill in the House passed with solely Republican support and Republican Gov. Ron DeSantis has hinted he may sign anti-Amendment 4 legislation. This bill would serve only one goal: to suppress the vote by overturning Amendment 4 and blocking returning citizens from voting. Florida had a poll tax once and we must ensure nothing remotely like it ever becomes law again. But, Florida Republicans aren't content to stop with a modern poll tax that requires citizens to pay fees to the government for the right to vote. Florida Republicans also are pushing another anti-voter bill, HB 7101. This bill would restrict the number of dates Floridians can vote by mail. If the bill had been law in 2018, more than 53,000 votes could well have been invalidated. This bill has already made it out of committee and could very well become law. Floridians don't support these blatant attempts at voter suppression, and we all expect better from our elected leaders. As Chair of the Florida Democratic Party, I am determined to fight, at every step, Republicans' efforts to suppress the vote, strip Floridians of their constitutional rights, and disenfranchise voters---in particular voters of color. That's why the Florida Democratic Party is investing $2.8 million to register 200,000 new voters before the Florida presidential primary. We are also launching a paid student organizing program called Organizing Corps 2020, that will train over 200 students to organize and register new voters beginning in the summer of 2019. The program is simple: provide paid training and mentorship to Florida college juniors who will organize their communities this summer, at their college campuses in the fall and join a Democratic campaign as a trained field organizer in 2020. And it's targeted at lifting up the voters whom Republicans have tried hardest to disenfranchise: young people and voters of color. But, with the history of voter suppression in our State, we cannot simply register new voters and leave them to fend for themselves in 2020. If this legislative session has taught us anything, it is that voter suppression happens well in advance of an election. It pains me to see Republican leaders working so hard to restrict voting rights in Florida. It begs the question: when Democrats are working so hard to lift up our democracy and ensure more people vote, why are Republicans doing the exact opposite? WASHINGTON -- Karen Seal Stewart is rich. And she wants to pay more in taxes. YES, YOU READ THAT RIGHT. Stewart is one of the Patriotic Millionaires, a group of about 200 wealthy individuals -- worth billions combined -- who say they should be taxed more, and as soon as possible. "It's a matter of equity, fairness and the fact that we have the money to pay the taxes and we're not being asked to pay them," Stewart, a former real estate executive, told NBC news. "My sense is we are really at a cusp. We better get our act together because......the lack of fairness and opportunity is growing." "We see how the system is skewed in our favor and that's really hurting our country, and in the long run, hurting us too," Morris Pearl, Patriotic Millionaires chairman and a former BlackRock managing director, said last week at a gathering for the group in Washington. For Pearl, it's about his kids and grand kids being able to "grow up in the same kind of country where I grew up, to have the same opportunities I did. And...(they) are not going to have the same kind of opportunities I had if we continue in the direction we're going." Many of those ideas are being floated on the Democratic campaign trail, where 2020 hopefuls are putting the wealth gap front and center. For some, like Sen. Elizabeth Warren, D-Mass., taxing wealth -- as opposed to income -- is the answer, a proposal that sets her apart in a democratic field that largely agrees on rolling back the tax cuts for corporations and top earners that were backed by President Donald Trump and Congressional Republicans. In fact, 63 percent of voters think higher-income people pay too little in taxes, according to a Politico-Morning Consult online poll. And Warren's plan plays well across party lines -- with 74 percent of Democrats backing her proposal and half of Republicans in that same poll. The millionaires aren't backing any specific candidate -- though they say Warren is right on taxing wealth. They just want action. "Important things" like infrastructure and health care require money, Stewart said. "You need to get the money where it is. It's with the wealthy...Do not feel sorry for us. We will still be fine. And the country will be better off." staying busy in off election year. 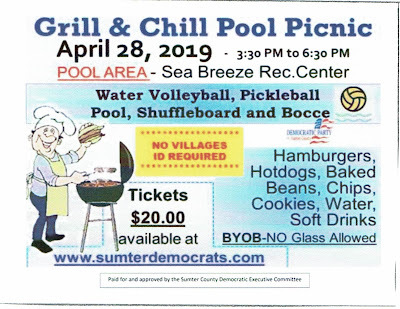 When the Sumter County Democrats decided to continue their lease on a building at 300 S. Main in Wildwood for their Headquarters, there was some question about the need with the 2020 election seeming far into the future. When a request for financial support from members easily raised enough money to pay the rent, they pressed forward. Today the the office is manned by volunteers on weekdays and the building is often a beehive of activity with workers addressing mailings, answering inquiries on the phone and from walk ins and committees meeting to deal with the many facets of the coming election. The 2020 election activity is roaring to life with even more vigor than many had predicted. On Monday, April 22nd the Democratic Executive Committee met for their regular monthly meeting, hearing reports on pending legislation in Tallahassee, updates on the Grill and Chill outing on April 28th and administered the oath of office to new precinct captains Miriam Hanock and Bob Janson, among other agenda items. Main Street in Wildwood is also Highway 301 and 300 S. Main is in what is often referred to the Save A Lot shopping center. The center also includes Ace Hardware and the Wildwood Post office and is a busy segment of the Wildwood retail community. Mary Scheiner, who just completed her term as interim President of the Villages Democrats, will be in Tempe, AZ April 27th to participate in Pat's Run, an annual event honoring Pat Tillman, an NFL football star who stepped away from his career at his peak to serve in the military and died when his unit was ambushed in Afghanistan in 2004. Mary, who comes from a military family, first ran the race in 2012 and now returns every year. She drew the attention of the Daily Sun, which ran an extensive story on her in the April 23rd issue. Congratulations and thank you Mary. 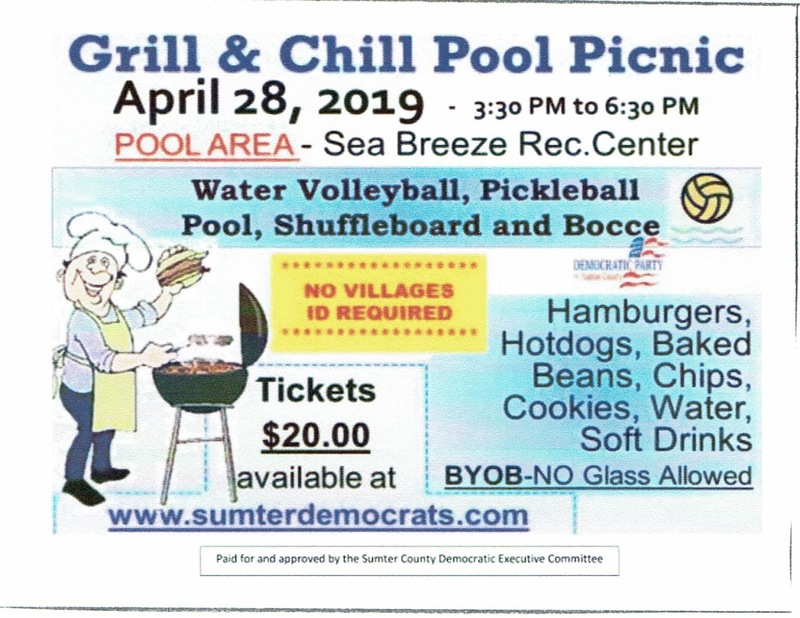 The Democratic Women's Club has issued an invitation to attend their Eleanor Roosevelt Tea and Luncheon on Saturday, May 18th from 11-2 at the Sumter County Democrat Headquarters at 300 S. Main in Wildwood. 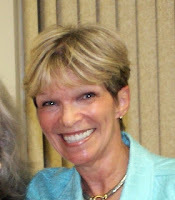 The speaker will be Pat Farley, President of the Democratic Women's Club of Florida. Her topic will be "History of the Women's Movement, the right to vote and the Ratification of the Equal Rights Amendment." The cost is $10.00 for members and $20.00 for guests, due by May 10th. No checks will be taken at the door. Make checks payable to DWCV and mail to : Sharron Chiodo, Treasurer, 3447 Ridgewood Path, The Villages, FL 32163. A Blog for Democrats and Independents. Earlier this year the Sumter Co. Democratic Executive Committee decided that since this was an off-election year it would be fun to hold a relaxed event where Democrats countywide could get together for food, fun, and relaxation before the campaign chaos kicked in. And then the campaign chaos kicked in. BUT WE'RE STILL GOING TO HAVE FUN AND RELAX! Play Water Volleyball, Pickleball, Pool, Shuffleboard and Bocce, or just relax and chat. Hamburgers, Hotdogs, Baked Beans, Chips, Cookies, Water, Soft Drinks, BYOB no glass allowed. Open to all Democrats - NO VILLAGE ID REQUIRED. A great committee has worked hard to make this an event open to all, we hope to see you there. The look on the Fox hosts faces when their audience cheered Medicare for All is worth the time! And some bad ideas about public education from the Governor. 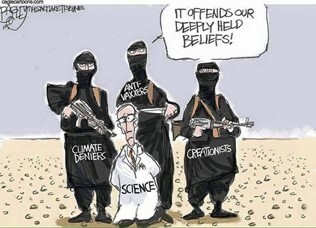 that schools teach creationism and off alternative views on climate change. "Big, Hairy, Audacious Goals" of Gov. DeSantis. 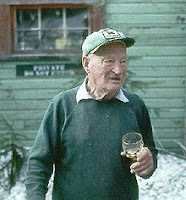 Harry R. Truman (not the President) was an eccentric curmudgeon who avoided most of civilization at the lodge he ran at the foot of St. Helens Mountain in Oregon for 52 years. In 1980 geologists warned the long-dormant volcano was rumbling back to life, but Truman dismissed the predictions and refused to leave or take precautions. After reporters made risky trips into the area, stories of Truman’s stubbornness and defiance made him something of a national folk hero. When earthquakes knocked him out of bed he moved his mattress to the basement. On May 17, 1980 state officials tried one last time to convince Truman to move, and again he refused. On May 18th, Mt. St. Helen erupted, with the entire Northern flank collapsing. It destroyed the lake adjacent to Harry’s lodge, burying the site under 150 feet of volcanic landslide debris. It took only a minute. It proposes a switch to renewable energy sources for the entire country, with a goal of achieving net-zero greenhouse gas emissions by 2030. It also calls for major investments in clean energy technology research and development. To be added are a federal jobs guarantee, basic income, and universal health care. David Levine, President of the American Sustainable Business Council sees the Green New Deal as a bold, new opportunity. He says, “We can build our nation’s infrastructure and tap America’s business innovation, while addressing climate change and broadening economic prosperity. Investing in clean manufacturing, energy efficiency, renewable energy, quality water, transportation and agricultural systems will create more resilient communities, better jobs and a thriving economy.” Levine calls the proposal a road map, rather than specific legislation. Critics say dubbing the proposal World War G would be more accurate, because, they claim, the plan commits the US to an endless, unwinnable global quagmire. This war, they say, is not one where we beat the enemy and bring the troops home, but is a constant never-ending struggle against humanity’s basic impulse to raise itself from poverty, with growth tied to continuing increases in greenhouse gas emissions. This space reserved for you! Helen Kelly of the League of Women voters explained the National Vote Proposal (NVP) to the Villages Democrats at the monthly meeting April 13th at Colony Cottage. The proposal would guarantee the winner of the popular vote would become President. The current system allows the winner of the Electoral College vote in a limited number of large states to win the Presidency while losing the popular vote. Americans elect all officials, from mayors to governors and state legislators to U.S. senators, via popular vote, except two—the President and Vice President of the United States. The LWVFL believes it is time electors are guided by the majority of Americans who agree on the person who should lead the nation. Acting in concert with the electoral system, they are working to educate the public and legislators about the benefits of legislation that would instruct our electors to vote for the Presidential candidate who captures the most votes in all 50 states. In the current Electoral College system, the presidency is awarded to the candidate who wins at least 270 of the 538 available electoral votes. The Constitution gives state legislatures the right to choose how presidential electors are chosen. Since the 19th century, each state (with the exceptions of Maine and Nebraska) has awarded its electoral votes to the winner of the popular vote in that state. But under the NPV system, states would commit to awarding their electoral votes to the winner of the national popular vote instead. Oregon could become the next state to join the compact pledging to devote its electoral votes to the winner of the popular vote in future presidential elections if enough states sign on. The State’s Senate passed a bill calling for Oregon to join the National Popular Vote Interstate Compact, which more than a dozen States and the District of Columbia have already entered into. The States will not shift their vote allocations until their combined electoral votes equal 270, enough to decide a presidential election. Currently, the number stands at 189, and Oregon has seven electoral votes. The bill, which passed the State Senate 17 to 12, now heads to Oregon’s House for consideration. Should it pass, it would be up to Democratic Gov. Kate Brown to either sign the bill into law or veto it. According to Oregon Public Broadcasting, Brown’s office has said she supports the measure. Last week, New Mexico joined the compact, which was already adopted by California, Colorado, Connecticut, Delaware, Hawaii, Illinois, Maryland, Massachusetts, New Jersey, New York, Rhode Island, Vermont, Washington State and the District of Columbia. An excellent presentation on this issue can be found on YouTube by entering "Vikram Amar should the President be elected by the people?" This is a 21 minute TED talk. Chris Stanley stepped up to the podium and received an enthusiastic welcome when she took over the reins as President of the Villages Democrats on April 13th. Following a brief summary of the club's origin in 2001 and growth since then, she reminded members of the goal of the organization is to elect Democrats. She advised them to avoid diversions, saying we can't handle every outrage flowing from Washington. Taking note of the large and talented field of candidates for President, she advised members to support their favorites, but to speak in positive terms of all of them. as the front runners emerge. "Keep your eye on the ball," she counseled. 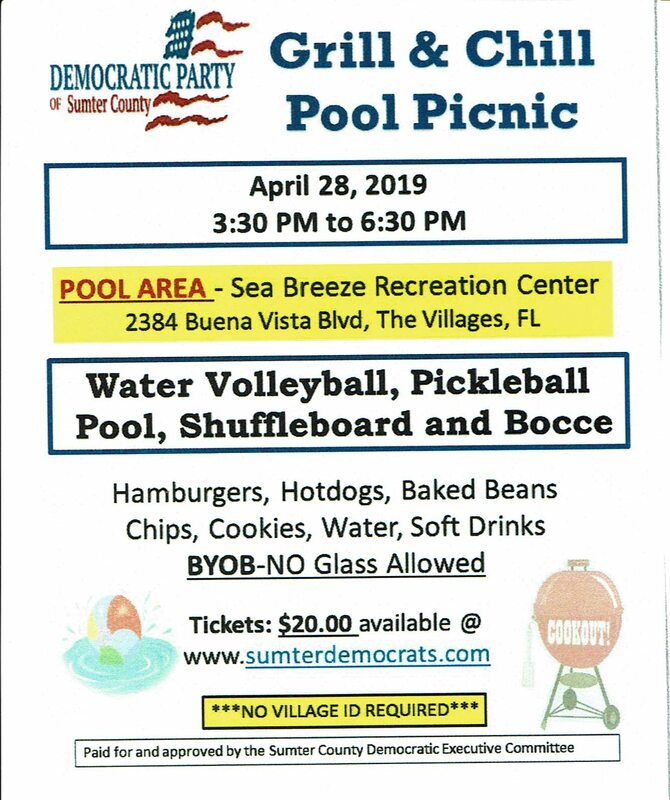 Deanna Dean, former Chair of the Sumter County Democrat Executive Committee, now a resident of Lake County, invites potential Democratic office seekers to attend a seminar on how to run for office on Saturday, May 4th. The location is the LCEA Building, 1713 South Street in Leesburg. It will last from 9 am to noon. Mike Hardy is heading candidate recruitment in Sumter County and persons interested in exploring their options can contact him by calling the County Headquarters and asking to have him call back. The Headquarters is located at 300 S. Main in Wildwood and the phone number is 352-794-1351. Want to dine with Dems? Want to play golf with Dems.? Want to have breakfast with Dems? Want to play board games with Dems? Want to know when Club and affiliated groups meet? Click on calendar and then click on the picture of the calendar. You'll find lots of good stuff. Want to keep up to date with affiliated club activities? Want to dine or play golf with other Dems? Want to be updated on key issues? Want to know what's going on at the county level? On April 3rd over a hundred Parkland survivors, students and gun control advocates stormed the State Capitol to protest House Bill 7093 which would arm teachers. House Speaker Jose Olivia delayed the hearing. 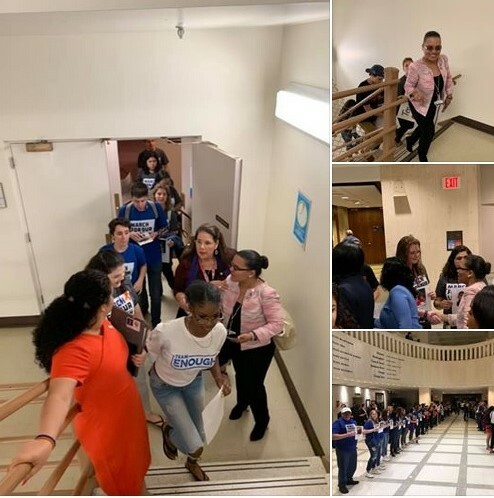 State Party chair Terrie Rizzo has called the action a new low and a sad day for our democratic process and urged the speaker to listen to the voice of Parkland survivors who traveled to Tallahassee to urge legislators to drop the plan. She added, "nothing matters more than keeping our kids safe and Florida Democrats will do all they can to block the legislation. “SB1272 may be well-intentioned, but it fails to protect the very constituencies that have been the subject of hate crimes in Florida, and in this country. My goal yesterday and going forward continues to be ensuring that all religions are protected. That’s why I raised the questions I did during the Senate Judiciary Committee meeting on Monday. But the bill currently falls short in guaranteeing that equal protection. “As it currently stands, this legislation fights the wrong battle, and targets the wrong enemy. It restrains school children from making anti-Semitic statements, but removes culpability for those who actually carry out anti-Semitic hate crime attacks. Doors open at 9:00 am, the meeting starts at 9:30 am. Don't forget your food bank donation and leave time to visit the display tables. This week's collection is for the Christian Food Pantry of Lady Lake. In addition to the usual food items, they particularly need: canned fruit, canned mixed vegetables, stewed or diced tomatoes and peanut butter and jelly. The usual items needed are: canned meats, including tuna, soups, vegetables, pork and beans, canned or boxed rice, canned or boxed potatoes, sauces. Boxed items: pasta, mac & cheese, cake mix, tea and coffee. In honor of Earth Day the speaker is R. David Walker,President of the South Florida Audubon Society. 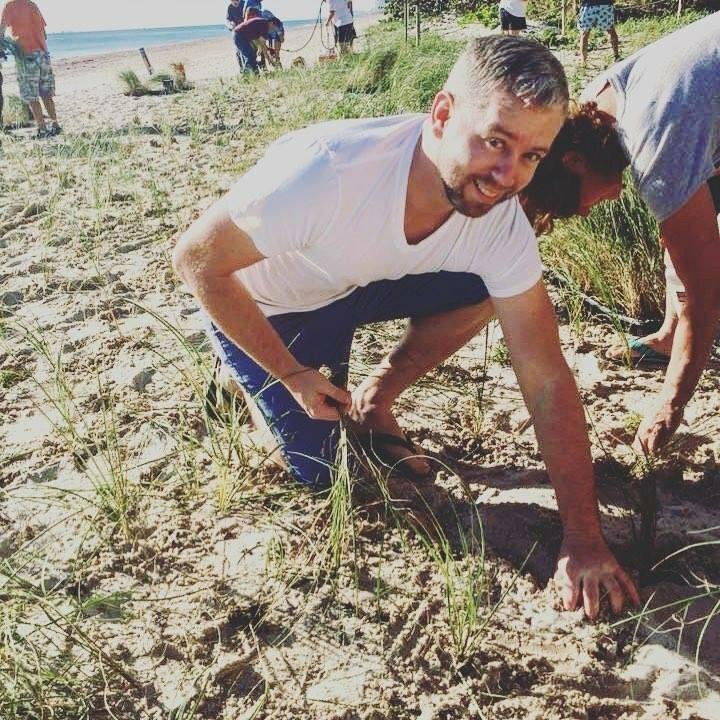 David is a fifth generation Floridian with a great love for our state and its' natural resources. He knows Florida's economy depends on the strength of our environment. 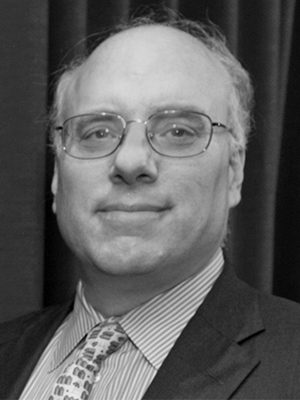 His talk will focus on the many water quality and water supply challenges that face the state and what can be done to address them. Audubon Florida has been at the forefront of almost every successful effort to protect wetlands and water resources. If you are confused by the many candidates seeking our party's nomination for President, you're not alone. The field is too large, in my opinion, but attrition will eventually take place. But what great ideas are emerging. 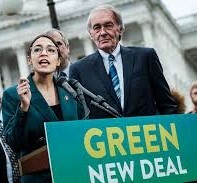 After months of enduring Donny Dimwit the demagogue and his conservative minions destroying democracy, it is wildly refreshing to hear bright people speak intelligently about climate change, how to meet the coming job losses created by automation and other real issues. Technology has always been our friend, but if driverless vehicles, self check out at stores and using your phone to scan bar codes, and even more shopping at Amazon continue, jobs will disappear. Some of the candidates see new jobs appearing and I look forward to hearing more from them. 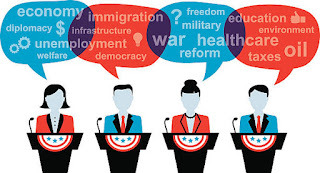 The first Democratic presidential primary debate, to be broadcast on NBC, MSNBC and Telemundo, will originate from Miami on June 26 and 27th. Line ups will be determined at random, with each candidate given a fair opportunity to make her or his case. 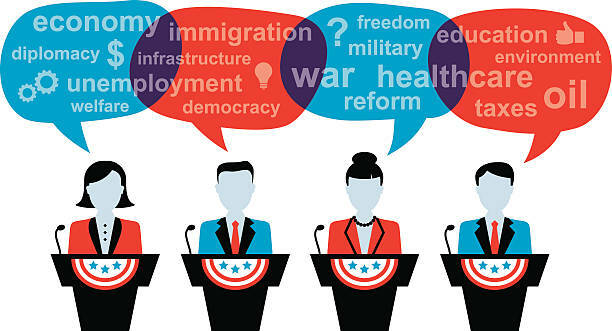 The debate will be streamed for free on NBC News' digital properties, including NBCNews.com, MSNBC.com, NBC News Mobile App and OTT apps in addition to Telemundo's digital platforms. Party Chair Terri Rizzo says, "when our candidates take the stage, they're going to show the American people the Democratic party is the party of ideas." I'm not OK with that! “My colleagues might think it’s OK that the Russians offered dirt on the Democratic candidate for president as part of what’s described as the Russian government’s effort to help the Trump campaign. You might think that’s OK.
“My colleagues might think it’s OK that when that was offered to the son of the president, who had a pivotal role in the campaign, that the president’s son did not call the FBI; he did not adamantly refuse that foreign help – no, instead that son said that he would ‘love’ the help with the Russians. “You might think it’s OK that he took that meeting. You might think it’s OK that Paul Manafort, the campaign chair, someone with great experience running campaigns, also took that meeting. You might think it’s OK that the president’s son-in-law also took that meeting. You might think it’s OK that they concealed it from the public. You might think it’s OK that their only disappointment after that meeting was that the dirt they received on Hillary Clinton wasn’t better. You might think that’s OK.
“You might think it’s OK that when it was discovered, a year later, that they then lied about that meeting and said that it was about adoptions. You might think that it’s OK that it was reported that the president helped dictate that lie. You might think that’s OK. I don’t. “You might think it’s OK that the campaign chairman of a presidential campaign would offer information about that campaign to a Russian oligarch in exchange for money or debt forgiveness. You might think that’s OK, I don’t. “You might think it’s OK that that campaign chairman offered polling data to someone linked to Russian intelligence. I don’t think that’s OK.
“You might think it’s OK that the president himself called on Russia to hack his opponent’s emails, if they were listening. You might think it’s OK that later that day, in fact, the Russians attempted to hack a server affiliated with that campaign. I don’t think that’s OK.
“You might think it’s OK that the president’s son-in-law sought to establish a secret back channel of communication with the Russians through a Russian diplomatic facility. I don’t think that’s OK.
“You might think it’s OK that an associate of the president made direct contact with the GRU through Guccifer 2.0 and WikiLeaks, that is considered a hostile intelligence agency. You might think it’s OK that a senior campaign official was instructed to reach that associate and find out what that hostile intelligence agency had to say in terms of dirt on his opponent. “You might think it’s OK that the national security adviser designate secretly conferred with the Russian ambassador about undermining U.S. sanctions, and you might think it’s OK that he lied about it to the FBI. Each of the factual points the chairman raised are supported by evidence, and as best as I can tell, none of the factual assertions have been contested by Trump, any of his allies, or the contents of Attorney General Bill Barr’s memo. 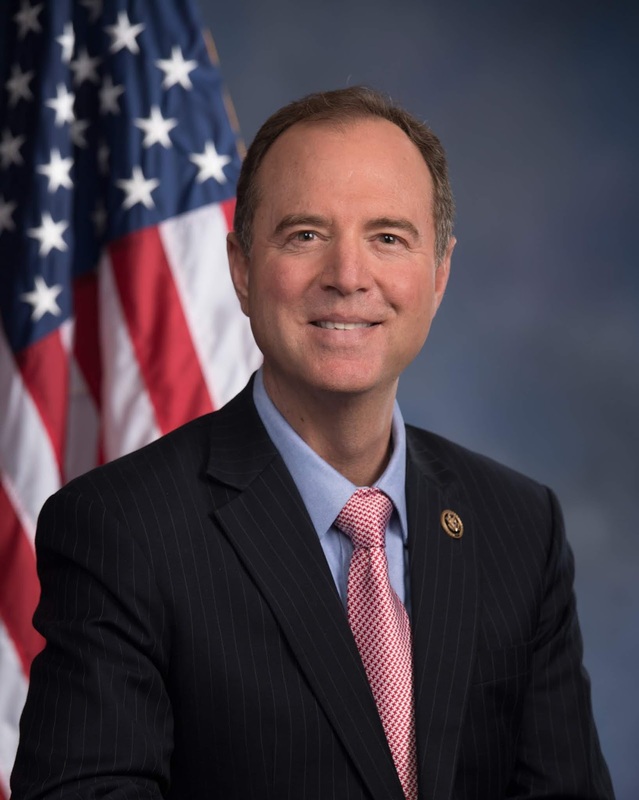 In theory, this should represent the end of the Republican tantrum over Adam Schiff. US: On March 30th we were at Democratic Headquarters honoring past and present Civil Rights leaders. Them: On April first, their meeting guest speaker was indicted Trump Adviser Roger Stone. When Jeff Yonce's health forced him to step aside as President of the Villages Democrats, Mary Schiener took over as interim President and has done an admirable job of juggling the many duties connected with the job. On April 13th a new, but very familiar face will appear at the podium when Chris Stanley takes the reins of the club. In her first official appearance on the job, she plans to give a brief club history and acknowledge past volunteer leaders who led the club as it grew to the largest in the state. Also on the program is a League of Women Voters presentation on the National Popular Vote Interstate Compact by Helen Kelly. Here is a brief explanation taken from Wikipedia. The National Popular Vote Interstate Compact (NPVIC) is an agreement among a group of U.S. states and the District of Columbia to award all their electoral votes to whichever presidential candidate wins the overall popular vote in the 50 states and the District of Columbia. The compact is designed to ensure that the candidate who receives the most votes nationwide is elected president, and it would come into effect only when it would guarantee that outcome. As of March 2019, it has been adopted by twelve states and the District of Columbia. Together, they have 181 electoral votes, which is 33.6% of the Electoral College and 67.0% of the 270 votes needed to give the compact legal force. 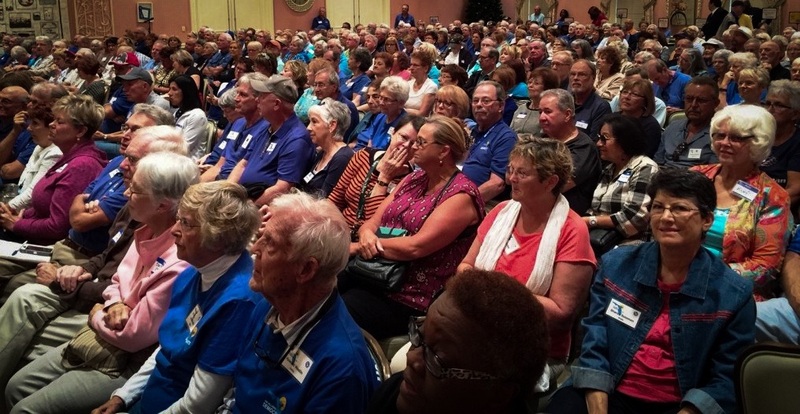 The Villages Democrats meet at the Colony Rec. Center with the doors opening at 9:00 am and the meeting beginning at 9:30 am. Leave time to visit the table displays in the entry room as much information can be found there. The April 13th meeting will probably be well attended, so remember the room has a capacity limitation that must be followed and blue wrist bands are handed out until they match that number and then the room is declared full. Prior to the Villages Dems monthly breakfast at Hacienda Hills we had put out a couple of requests from EPIC (our committee focused on education issues), for some items needed by the P.R.E.P. school in Wildwood. Thanks to you Committee Chair Gerry Van Luven reports the receipt of 40 full-size boxes of tissues (apparently in somewhat short supply in the waning days of the cold and flu season) and a number of cartons of granola bars. Three-ring binders didn't get much attention and only one was donated. The donations filled the rear of Gerry's car and she immediately took them to the school, where it took her and the assistant Principal three trips to haul them into the building. Your generosity is greatly appreciated and thanks to EPIC for all they do. Sue Blalock, on the left, guided the Villages Democratic Club to a rousing beginning, organizing the Spring Potluck at Colony Cottage on the evening of March 29th. and deserts, the crowd danced to the music of Bill Board and the Headliners. Thanks to Sue and her committee for a well organized and fun evening. Now that the Democrats have taken control of the House, their "Medicare for All" proposals are going to get hearings and scrutiny. One feature of Bernie Sanders' version that hasn't gotten a lot of attention yet, but it will: the plan has no deductibles or other forms of patient cost-sharing. Why it matters: In a country where so many Americans are bedeviled by medical bills, especially people who are sick and use a lot of medical care, this would be a big deal. It would actually make our system more generous than any of the other developed nations that Democrats like to cite as models for our own. Details: It may be surprising, but no other developed nation has zero out of pocket costs — even those that treat health care as a basic human right, as Medicare for All supporters want to do. That’s because their national health plans have cost-sharing, or allow people to purchase health care outside the plan, or both. Even in the United Kingdom’s very comprehensive National Health Service, there are copays for some drugs and consumers pay a substantial amount for long term care. Consumers in other high-income countries spent an average of $857 per person out-of-pocket on health care in 2016, ranging from $467 in France to $2,326 in Switzerland. Other congressional proposals that would expand access to Medicare or Medicaid have various cost-sharing arrangements based on the Affordable Care Act, Medicare, or cost-sharing levels set by states. The big picture: Deductibles and other forms of cost sharing have been rising steadily in private coverage, far outpacing wage growth. The Sanders cost-sharing strategy could make the proposal more popular to the more than 150 million Americans who would have to switch from their private coverage to join a national plan. It will certainly appeal to the one-third of people in fair or poor health, with insurance, who had trouble paying for health care in 2017. The catch: A zero cost sharing approach is also sure to make any Medicare for All plan more expensive — because if the patients aren't paying for any of the costs, the government has to pick up the entire bill. It will also subject any plan to the inevitable criticism that it will lead to overuse of medical care and drive up health spending since there wouldn't be any incentive for patients to worry about costs. What to watch: House Speaker Nancy Pelosi has said that hearings may begin soon in the House on Medicare for All, but we are far from the stage where legislative sponsors have had to make significant compromises in order to get a bill passed. If and when the debate gets to that point, it seems likely that there would end up being a modest level of cost sharing to deter unnecessary use of medical care and keep the overall costs of the plan down. No doubt cost-sharing would be kept lower than it generally is today, both as a selling point and to eliminate the barriers to care and economic burdens high cost-sharing has become today for many families. It is also possible that enrollees would be allowed to buy additional care outside of the plan, as they can in some other countries. The bottom line: There will be plenty of other arguments, for and against a Medicare for All-style plan. But the burden of rising out-of-pocket costs is one reason the plan could have appeal for many Americans — even if it's not possible to get rid of them completely. Narcissists often lack a conscience, so climbing in the ring with one is like bringing a knife to a gun fight. Wielding cruelty and abuse like it's their right, the narcissist easily wounds a person with a conscience who often feels guilty for firing back. The guilt perpetuates feelings of responsibility and self-doubt, frequently causing the person with a conscience to surrender. So how does a person create a fair fight? The most effective way is to fully understand the narcissist’s most lethal weapon, projective identification, and to disarm it. Projective identification is the most powerful psychological mechanism in a narcissist's arsenal. It is what creates the toxic chemistry that psychologically chains an empath to a narcissist. Projection, which is the first component of projective identification, is a psychoanalytic term used to describe the unconscious process of expelling one’s own intolerable qualities and attributing them to someone else. For example, an individual who routinely acts rude may call someone else rude. This person does not see the quality in himself or herself but perceives it in others. Narcissists utilize this defense mechanism routinely. Villages Democrats Board member Sue Dubman is a member of the Union of Concerned Scientists who released a report last month titled "The State of Science in the Trump Era." The report can be accessed online at https://www.ucsusa.org/center-science-and-democracy/state-of-science-trump-era. Also, in this folder, is a presentation on Medical Science in the Age of Trump and the UN Climate Report. An oldie but goodie is "Trump's Craziest Statements on Science". It is on YouTube at https://www.youtube.com/watch?v=jrBcxv4NCds. A couple of pictures from the Lake County Gala that didn't make it into the last issue. Dee Melvin manning Congressional Candidate Dana Cottrell's table. Dana spoke to the audience prior to the address by Andrew Gillum. She and Gillum are shown reacting to the crowd prior to the dinner. On Saturday, March 30th an Inaugural Reception was held for the "Wall of Honor" at the Democratic Headquarters in Wildwood. The committee that pulled it all together included Alex Marino, Cris Andersen, Pat Beerhalter, Anita Crumel, Brenda Edwards, Cathie Hardy, Ruby Perry, Heather Rabinowitz, Jim Shields, and Marilyn Shields. The theme for the first quarter of the year highlighted the 13th, 14th and 15th amendments to the Constitution, the Civil Rights Act of 1964 and the Restoration of Rights: Amendment 4 for Florida in 2018. Seventy-one individuals were nominated, ranging from past presidents to school lunch ladies. Information on each nominee has been entered into a binder which is maintained near the wall for everyone to read. Many of the names are from the pages of history, but there are also names of people who played vital roles but are relatively unknown. The following pictures and information highlight nominees who attended the reception. Bill Fisher Mr. Fisher, who also acted as guest speaker for the event, is a retired prosecuting attorney in Philadelphia. He is honored for his counseling on the Rights and Justice Task Force, also known as Florida Amendment 4, the voting rights for Felons Initiative. Michael Hardy. Mr. Hardy headed the NAACP in Orange County, Florida in the late 60s and early 70s. In that capacity, he brought suit to desegregate the County schools. Originally the case was denied, but then it was overturned by the U.S. 5th Circuit Court. Birdie Mitchell, seated, was nominated by her daughter Dee Williams. In 1983 Birdie's boss at the postal station where she worked turned down her request for time off to attend the Civil Rights March in Washington. She politely told him President Kennedy had said any postal employee could have the day off with pay and she was going. Her husband joined her and the two of them were there for Dr. Martin Luther King's " I have a dream" speech. Rodney Harris and Michael Pfaendtner are childhood friends who remain close as adults. After Trayvon Martin was killed, their discussions led to the creation of the short film, "A Continuing Series of Small Indignities." In the film Rodney discusses the racism with which he grew up and continues to encounter. The film is presented to organizations, then followed by a discussion on how to promote a better understanding of racism in our society today. Jill Moss Greenberg, close with the Kings, was nominated in particular for her role with Coretta Scott King in making Martin Luther King Jr. Day a federal observance. The Villages resident remains astounded by what King accomplished in his 39 years of life. She says he demonstrated how much of a difference one person can make. Rev. Thomas H. Poole, Jr. shown at the left, nominated his father Thomas H. Poole, Sr. Mr. Poole was involved in Civil Rights leadership for 56 years, including being elected President of the Tri-City Branch of the NAACP for Lake County in 1968. His son recalled that his father organized the Lake County Voters League, responsible for many voter mailing campaigns. Al Mytty on the left and Larry Berman on the right, were nominated for their active roles in the Sumter County Democratic party and their efforts in the Rights and Justice Task Force. Better known as the Florida Amendment 4, the Voting Rights Restoration for Felons initiative. With the passage of the Amendment, more than one million individuals who have paid their debt to society will now gain the dignity of having their right to vote restored. Heather Rabinowitz is probably the most active Democrat in Sumter County. One of her projects emerged when she and her good friend Anne Timoner created a program to inform the unaware about the underlying conundrum of unrecognized "white privilege." They brought in many learned scholars to speak on the issue. Community buildings were selected for the presentations so attendance would not be limited to Villagers. Anne Timoner authored "Finding Grace," the story of the African American woman who raised her due to her mother's illness and her bewilderment as a child watching the prejudice endured by her beloved "adopted" mother. 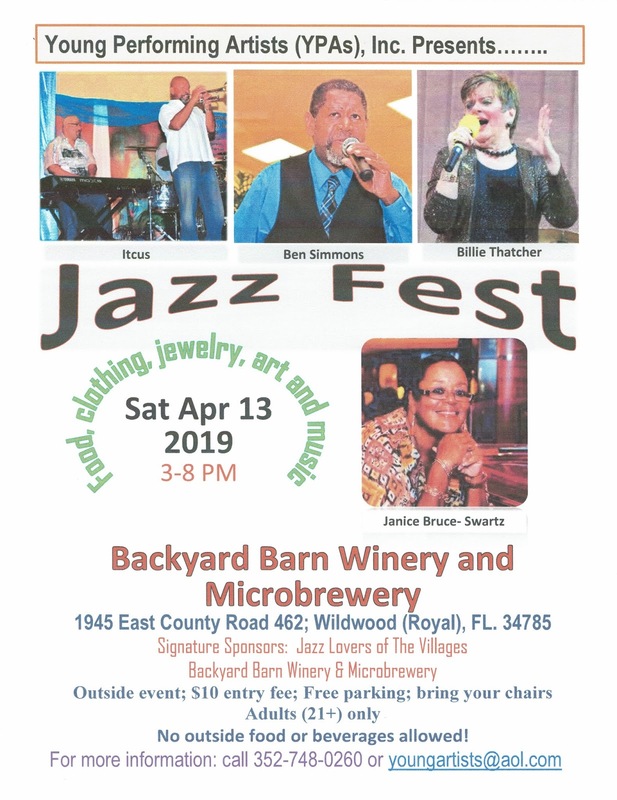 Anne is an ambassador for Young Performing Artists, Inc. the non-profit founded by Beverly Steel, a community leader in the historic African American community of Royal. Anne has helped Villagers to know and visit this community by advertising "40 Acres and a Mule," tours as well as selling tickets to the Soul Food Festival that helps fund children's camps as well as the Young Center Museum Beverly manages, especially important this year since the Governor cut all the state's arts funding. An appreciative crowd paid tribute to the nominees who spoke at the reception. The pictures and stories above are a small sample of the stories in the book of nominees. Some of the nominees are well known, but many are "ordinary" people who did extraordinary things. 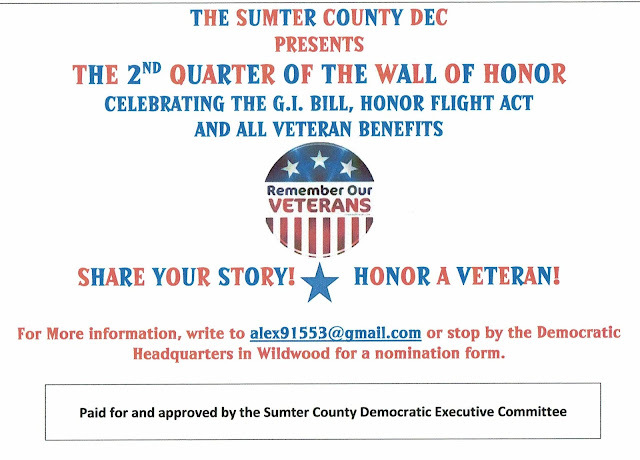 The 2nd quarter of the Wall of Honor will celebrate the G.I. Bill, Honor flight and all Veteran Benefits. 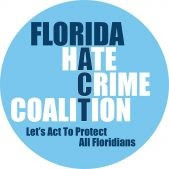 Although Florida has a hate crime law, it does not protect all Floridians. Senate Bill 940 (SB940) would make the hate crime law comprehensive by fixing critical gaps in the statute. Help protect all Floridians by urging the Florida Senate's Criminal Justice Committee Chair to hear SB940. In Florida, a hate crime cannot be charged if a victim is targeted because of a physical disability such as blindness, or because of a victim’s gender or gender identity. The law also does not cover “association with” hate crimes where, for example, a person is victimized for being at a bar or restaurant with African American, Hispanic, Muslim, or Jewish friends. It also does not cover “mixed motive” hate crimes. So, for instance, if a perpetrator involved in a fender-bender assaults the other driver while yelling racial epithets and angry remarks about the accident at the victim, a hate crime cannot be charged. SB 940, filed by Senator Kevin Rader (D-29), would fix all of these issues with the current hate crime law.